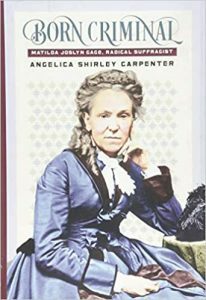 Born Criminal: Matilda Joslyn Gage, Radical Suffragist, by Angelica Shirley Carpenter (South Dakota Historical Society Press, 2018, ISBN 978-1941813188). 272 pp. Hardcover, $16.95. Sexual assault, misogyny, racism, isolationism, homophobia, human rights violations, and the Christian Right’s use of the Bible to justify all of the above—the news stories of the past few years in the United States would not surprise nineteenth-century radical suffragists, the women who started the fight for the vote. While the most famous suffragist, Susan B. Anthony, was focused solely on voting rights for women, other suffrage leaders such as Elizabeth Cady Stanton and Matilda Joslyn Gage understood that respect for women as citizens was dependent upon respect for all people and their natural rights. As a woman, Gage believed she was “born criminal,” because the exercise of her rights was against the law. In particular, Gage connected the oppression of women and girls with the oppression of indigenous and enslaved people by a patriarchal system, a combination of religion and government that satisfies its lust for power by waging war, stealing the results of labor, abusing those who are vulnerable, and suppressing science. If you’ve heard of Anthony and Stanton but not Gage, you’re not alone. Written out of history for being the most radical and outspoken of the three, Gage is gradually reclaiming her place as an important leader in the first phase of the woman’s suffrage and women’s rights movements. Her comeback started in 1973, when historian Sally Roesch Wagner took on the job of researching and writing about Gage and creating a foundation to buy her 1854 home in Fayetteville, New York, turning it into a museum dedicated to social justice. Wagner told Gloria Steinem about Gage, who calls her “the woman ahead of the women who were ahead of their time.” A new biography of Gage by Angelica Shirley Carpenter, Born Criminal: Matilda Joslyn Gage, Radical Suffragist, will further increase the number of people who know about Gage and her many contributions to the causes of equality and freedom.